After what was supposed to be the clash of the Titans, East Bengal sealed a thriller to keep their title aspirations alive. Thanks to a phenomenal signature strike from Goan veteran Cavin Lobo, who blasted the ball into the top right corner of the net past a desperate and outstretched Dagar. Barring the goal, there wasn’t much to talk about the game despite two genuine penalty appeals being snubbed on either side of the half in favour of both the contingencies. There were a few intriguing substitutions too which defied the rudimentary of football. However, despite all the spice, a kissing spree from Eduardo Ferreira and all theatrics on the ground the affair was drab and witnessed an epic screamer from Lobo and a decent performance in both the rearguards. Mahmoud Al Amna’s comeback will go down in history as a glorious one. The Lebanese midfielder did all he could have done to dampen the spirits of Minerva. His essays spawned right from the outset as he tried an ambitious shot at the Minerva goal from distance. However, the shot lacked enough sting to bedevil Rakshit Dagar as the Punjab custodian collected it without much trouble. However, this shot had made his intentions clear which were to come for the match. The abysmal ground conditions made playing football really elusive for both the outfits. However, East Bengal came into the game with loads of experience and with the hunger to cut the gap down at the top. They needed a honcho upfront. Amna delivered himself to his team’s needs. Amna had to be fouled often to thwart him from making his blistering runs. This led East Bengal winning multiple fouls. Amna induced speed and physique in the midfield which compelled Minerva to stick almost three players in order to curb this man. Amna flayed multiple crosses from the wings for the players to latch on to and punish the Minerva rearguard. However, most of them went begging and East Bengal was still stuck at the impasse. Amna was the one who teed up Cavin Lobo for his phenomenal strike. While he was guarded by three Minerva defenders in an attempt to thwart his slick dribbles and a sudden outburst in the attacking zone, this left acres of space open for Lobo who was already rushing in to take the position to release a pile-driver. Amna cleverly flicked the ball back for Lobo with a delicate and precise back heel. Lobo was all up for this opportunity. Without shying away from the goal or flaying it for someone else, he blasted the ball with clinical precision into the top right corner of the net which let a flying Rakshit Dagar down. Post the goal, Amna was the sole man upfront trying to create opportunities in bits and scraps. However, against four men, it was an uphill task for him to create anything. Despite his heroics, he had to be sated with scourging the Minerva goal and not having a goal for himself. However, he was rightly adjudged as the hero of the match. Substitutions are basically an added behoof granted to the teams in order to induce speed and new life in the field when most of the players tend to be jaded. However, you need to sow the correct substitutions in order to reap the right fruits. This is exactly what dented Minerva Punjab. Right after Minerva conceded the goal wherein Rakshit Dagar was not at fault by any chance, as the strike itself was a stellar finish by Cavin. Khogen Singh withdrew Rakshit Dagar and introduced Kiran Limbu in the goal. The intentions were so very not clear. This may probably feel that this substitution was to take East Bengal flatfooted and leave them dazed and confused. However, the reality is something which is drastically different. Dagar showed signs of promise after he pulled remarkable saves in a couple of one-on-one occasions and he was also swift on his feet to collect the balls which were triggered at the Minerva goals from the set-pieces. He rose beyond players like Amna and Lobo to clear whatever danger that fell in his way. 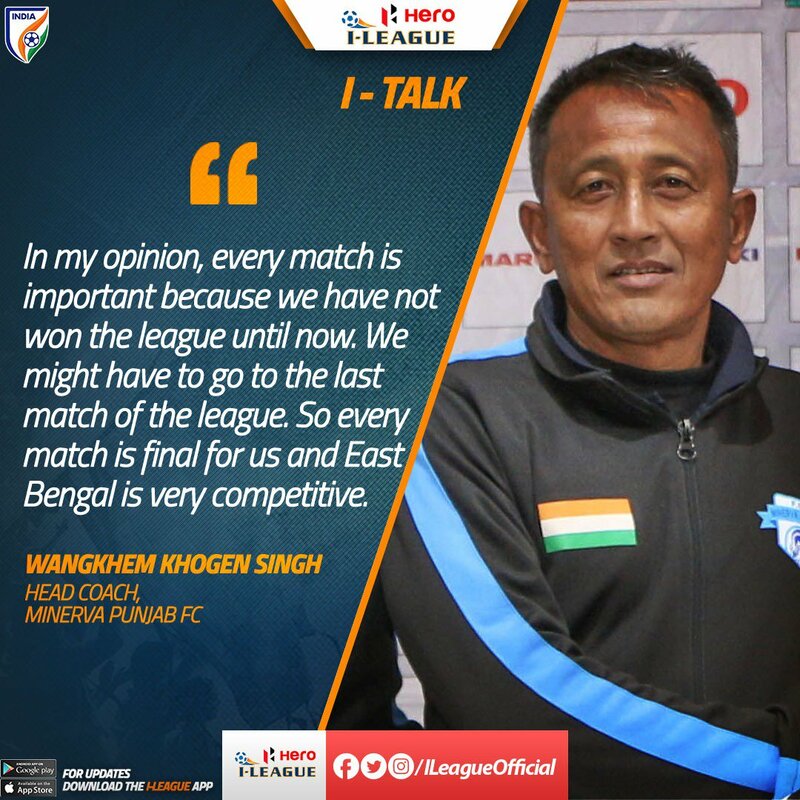 However, with his substitution, Khogen Singh simply squandered away what could have been another opportunity for him to bring on a probable striker or an attacking midfielder to heap the pressure on East Bengal to restore parity. Only if William would have headed the ball home from the point-blank range, this point would have been absolutely null and void. However, William, with all the time and space in the world accorded to him, headed the ball calmly towards the corner flag, thereby frittering away the best chance to draw Punjab level. 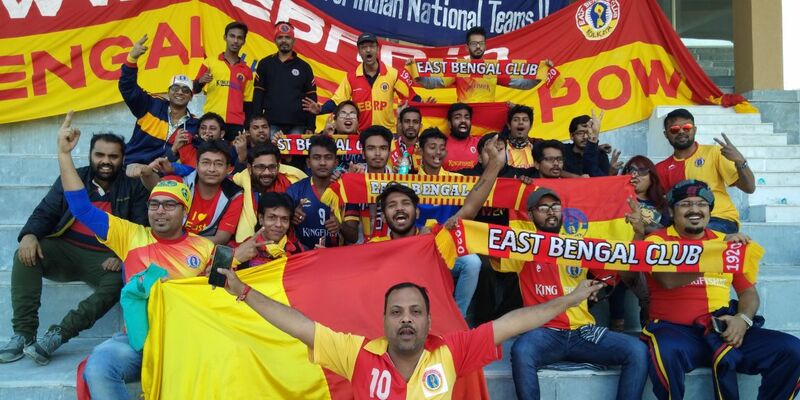 However, barring this occasion, the East Bengal defence exhibited massive heart and an absolute steely mettle under the cosh to come out in flying colours. Brazilian stalwart, Eduardo Ferreira led the defence alongside a veteran like Arnab Mondal and a hardy Lalramchullova. With Punjab pressing doggedly against a resolute defence, it was an intriguing battle to witness. Chencho’s effectiveness was nullified for the most of the match after Khalid Jamil deployed zonal marking to quell the efforts of the Bhutanese Ronaldo. Every single time the new Bhutanese sensation received the ball, Amna, Yusa and Salam Ranjan Singh took turns in harrowing him. Despite all the work from East Bengal, Chencho still managed to unleash a few shots of his own which were parried deftly by Ubaid of East Bengal who was shouldered with the onus of keeping the goal. Minerva resorted to long balls for William and Chencho. However, most of them were rescinded by Eduardo in the rearguard as he came out flying in the defence trading them either for throw-ins or cleared them out of the danger zone. Arnab Mondal was found sloppy on a few occasions but he redeemed himself after a few decent blocks at Chencho’s efforts. Chullova continued with his blistering runs alongside Lalrindika Ralte and still managed to fall back to dispose of his defensive responsibilities with utmost efficacy. Minerva threw everything they had at East Bengal but the team from Kolkata showed no signs of stopping and matched the table toppers beat by beat and finally made them dance to the hum of their own drums. There was a point in time in the Indian football canon when Cavin Lobo was one of the most sought-after midfielders. However, injuries plagued his scintillating career. He is currently all but a former shadow of his scintillating self, plying his trade for East Bengal. However, he made it very clear that it is still not the time to write him off the books. 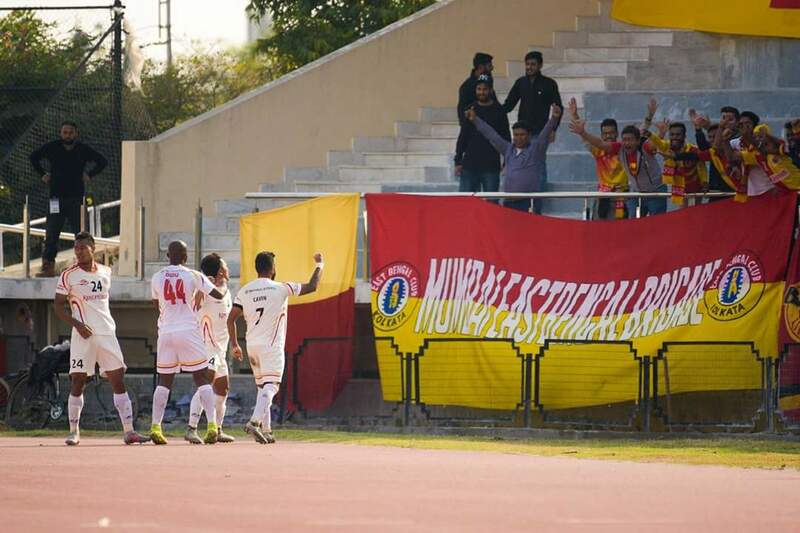 Despite all the brazen moves from East Bengal, they were not able to locate the back of the net in the ongoing game as the Minerva backline held them at bay for an hour. Long rangers, quick flicks, acrobatic essays, nothing saw the light of the day unless this happened. Salam Ranjan Singh danced down the middle of the pitch and delivered a peach of a cross for Kromah who as usual made a hash of things after he entangled himself in a needless tackle with Dagar. Rakshit Dagar charged down his line in order to thwart Kromah from receiving the ball. However, instead of snatching the ball from Kromah, he fisted the ball away which gave ample time to Kromah to recuperate and pass it back to Al Amna. By this time, Dagar made quick grounds to return to his erstwhile position while Amna drew the defenders towards him making space for anyone who will charge down the center and probe Dagar with a probable tracer bullet flying from his feet. Guess who arrived to manifest Amna’s envisaged move? It is none other than the once sought-for Goan sensation, Cavin Lobo. Amna flicked the ball towards him with a deft and delicate back-heel. With all the space in the world, Cavin Lobo let fly of a meaty strike which flew into the back of the net faster than a torpedo, striking the heart of the Minerva Punjab ship which would eventually succumb to this strike and drown to make the title fight a lot more lively and interesting. Minerva’s firepower seemed extremely limited against the likes of the resolute East Bengal defence. William, Aidara, and Bazou Armand seemed absolutely toothless in-front of veterans like Arnab Mondal and Eduardo. However, Chencho who has recently been dubbed as the Bhutanese Ronaldo kept on harrowing the East Bengal deep defence. He had three valuable contributions to the game which could have easily changed the complexion of the game, but a couple of good saves from Ubaid and a magnanimous profligacy from William dashed hopes of a Minerva comeback. Near the 75 minute mark, Chencho danced past a couple of East Bengal defenders with consummate ease and then with only the goalkeeper to beat, he unleashed a screamer of a shot at the East Bengal goal. Ubaid, who grew in confidence and stature with every passing minute in the game, dived down his left to parry the strike and keep the game in the balance. Moments later, Chencho was again on the run after being teed-up by William this time and his shot down the right flank was again dealt with in a stringent manner by a high-soaring Ubaid who parried it for a corner. Chencho returned the favour to William in the dying embers of the regulation time after he sped past three East Bengal defenders with blazing speed and whipped in a picture-perfect cross for William to head home. With the goal absolutely open and with a probable universe of space in front of him, William miscued his header and put an end to Chencho’s essays of staging any comeback. Who is most likely to win the league this season?